My name is Tamika Rybinski. I am a SAHM to three lovely little ones. Our family is pretty diverse. We live in 3 cultures at once. My husband was born and raised in Poland, I was born and raised in Colorado. We met and married in Oklahoma and are now raising our family in Austria! I am new to the blogging world. I started my blog No Time for Tea Parties to have a little something just for me. Creative activities calm and reenergize me. With 3 kids 8, 2 and 3 months, I keep pretty busy. On top of that it can be tiring to navigate through different cultures. I am always learning and adapting, so are me kids. I blog about our life, adventures, cultural discoveries and everyday happenings. I enjoy painting, sewing, taking pictures, creating recipes, travel and spending time with my kids. You might be interested to know that I am a cancer survivor, former Teacher, Mary Kay Director and Model. I am have enjoyed sharing a little about my life. Thank you Danielle for the opportunity. Come on by and see what is keeping me so busy! Have a great day! What a lovely blogger you have featured! 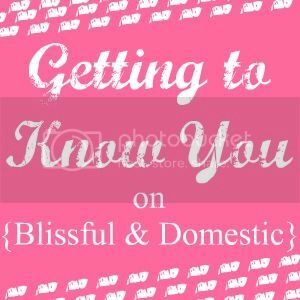 So nice of you to host Getting to Know You Sunday! Great post by Tamika. Great of you to host. Thanks for stopping by and following. I'm following back via Linky. Looking forward to getting to know you in blogland.